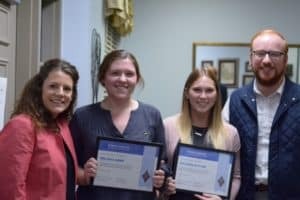 Jessica Mahoney, Pi Beta Phi chapter adviser, left, and Taylor Dwyer, Franklin College’s assistant director of student involvement and Greek life, right, present endowed awards to Melissa Beer and Brianna Hutton. The Indiana Alpha chapter of Pi Beta Phi Fraternity for Women is celebrating its 130th year at Franklin College with the establishment of an endowed award fund, a campaign originally launched during its 125th anniversary year. The IN Pi Beta Phi 125th Anniversary Award Fund will provide monetary gifts for qualified students in the organization. Eligible applicants must be initiated members of Pi Beta Phi, who are in good standing with the college and who uphold the fraternity’s core values: integrity, commitment, personal and intellectual growth, philanthropic service and sincere friendship. More than 50 alumnae and friends have contributed to the fund thus far. The awards generated can be used for any college-related expense. To date, more than $19,000 has been raised, according to the project’s lead fundraiser Nora (Lowe) Brems ’87. Donations continue to be accepted, Brems added, as part of an effort that started in 2013 at the sorority’s 125th anniversary celebration. All initiated members were eligible to complete the application for the inaugural round of awards, which were bestowed during the 2018-2019 academic year in celebration of the organization’s 130th anniversary. In the future, award recipients will be recognized in the fall at the annual Homecoming and Alumni Weekend Pi Beta Phi Breakfast. Jessica (Lillpop) Mahoney ’96, fellow Indiana Alpha alumna and the chapter’s faculty adviser, is tasked with reviewing the applications with Taylor Dwyer, Franklin College’s assistant director of student involvement and Greek life. Like Brems, Mahoney sees the award fund as a chance for Indiana Alpha alumnae and friends to invest in the future of the organization and to reward the women who best uphold the fraternity’s missions and values. This year’s recipients are Melissa Beer, daughter of Todd and Kristina Beer of Fremont, and Brianna Hutton, daughter of Glen Hutton of Rockville. Nationally, Pi Beta Phi is the first college society for women to be modeled after men’s Greek letter fraternities. The Franklin College chapter, Indiana Alpha, was founded on Jan. 16, 1888 and holds the distinction of being the state’s first Pi Beta Phi chapter.